TRIPOLI, Libya - Thousands of protesters took to the streets of Tripoli, Benghazi and other cities across Libya on Friday in support of a renegade general’s campaign against Islamist militias and his calls to suspend parliament. The protest, dubbed the “Friday of Dignity,” took its name from the offensive launched by the former general, Khalifa Haftar, one week ago in the eastern city of Benghazi. 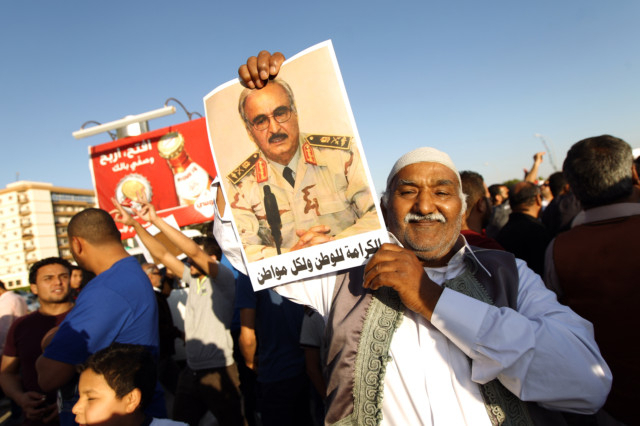 Haftar has since garnered support from current and former military officers, political figures, civil society groups and the militias that dominate many Libyan cities. Friday’s demonstrations were some of the largest the country has seen since the uprising three years ago. The Haftar-led revolt has ignited a long-brewing political crisis and is posing the most serious challenge to the Libyan government since the overthrow of Muammar Gaddafi in 2011. The interim government issued a statement in support of Friday’s protests and reasserted its proposal this week to suspend parliament. “The participation of tens of thousands [in the protests] requires all to answer to the demands of the people who represent legitimacy that can’t be ignored,” the statement said. Hundreds of demonstrators gathered in Tripoli’s Martyrs’ Square on Friday afternoon, chanting against the parliament and in support of a national army and police force to replace the militias that emerged after the 2011 civil war. Many of the militias are on the government payroll, although they remain loyal to their own commanders rather than the state. Haftar is riding a wave of popular discontent directed against the central government, which has failed to tackle rising lawlessness and a string of assassinations that have plagued eastern Libya, particularly Benghazi. “We reject these militias. We are here in support of the army and police, and we are here for dignity,” said Youssef Gbali, 51. The demonstrations - the first since the 2011 uprising to be held simultaneously in cities across Libya - put more pressure on the embattled Islamist-led parliament to offer concessions. Two days after the former general’s initial assault, the Haftar-allied Qaqa and Sawaiq brigades, linked to the western city of Zintan, stormed the Islamist-led parliament as it was planning to confirm a controversial new prime minister, Ahmed Matiq, who was appointed May 4 in a disputed vote. The attack by Haftar’s self-declared Libyan National Army prompted the head of the parliament, Nouri Abu Sahmein, to call on a powerful militia ally to deploy to the capital to protect the assembly. Known as the Libyan Shield Central, the militia, from the western city of Misrata, streamed into Tripoli on Thursday, raising the specter of an all-out conflict between rival militias loosely aligned with opposing political groups. The question of legitimacy is at the root of the crisis. The GNC’s mandate was set to expire in February, but the assembly decided to extended it, an unpopular move that sparked demonstrations. A week later, Haftar gave a televised address in full uniform denouncing the government and calling for its replacement. Government officials accused Haftar of attempting a coup and demanded his arrest, although he was never taken into custody. Instead, he spent months in eastern Libya, holding court with former military officers, tribal leaders and militia commanders who shared a common enemy - the Islamist militias and their political allies. Last week, Haftar struck. More than 70 people died in some of the heaviest fighting since the civil war three years ago. But his offensive - which he classified as a war on terrorism - has all but ceased, and he has instead focused his attention on disbanding parliament. “On the ground there is no actual operation. Other than what happened last Friday, there’s been no military action,” said Mohammed Abu Jannah, an activist and journalist in Benghazi. Parliament is scheduled to convene Sunday to confirm Matiq as prime minister, a move that has the potential to ignite clashes between the two powerful militia groups, both of which have taken up positions in Tripoli.